Grado RS2 review | What Hi-Fi? 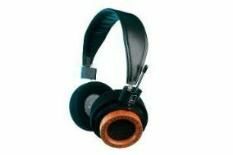 With their open backed wood earpieces and long rubber cord, these Grados are lookers, although comfort might be an issue for some. They offer a rich, detailed sound that's punchier than the Grado SR325is. The mid-range is emotive, while the clear treble and fluid bass contribute to the honest picture they produce. A joy to listen to.